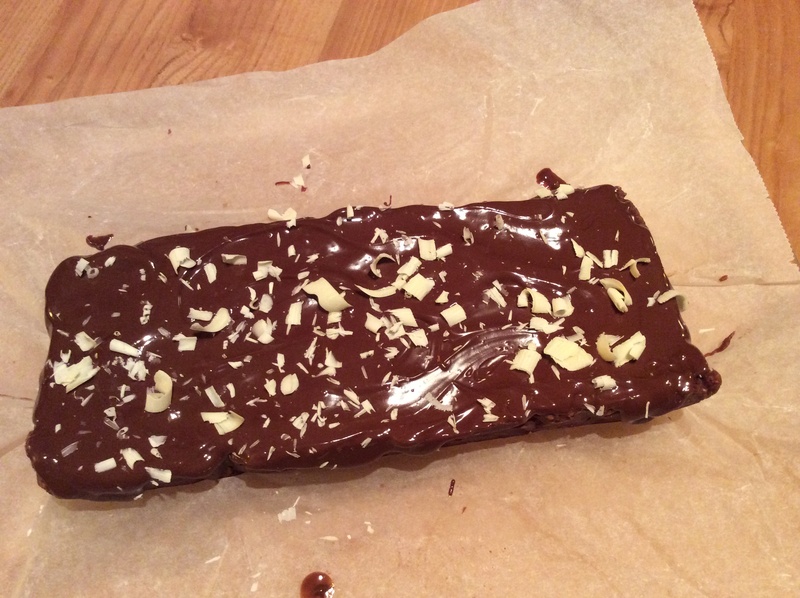 COOKIE QUEEN’S FRIDGE CAKE – No oven, no scales, no skills necessary! There is always some eating disorder or another going on in my household. You know, high carb, low carb, no carb and so forth. My son is a body builder and has spent the winter months “bulking”, which means eating around 5000 calories a day, and lifts heavy weights to build up muscle under the fat layer. As of Monday it is time to start “shredding” or “cutting”, which means an absolute change of diet. Not least of all “no sugar”. So it’s a good time to share a highly calorific, fat laden, sugar laden, no cooking necessary fridge cake. Because it’s the last one until Christmas in this house. My 19-year-old daughter is naturally on a low fat, low sugar, low carb diet most of the time, but who can say no to this?She even helped me make it for the photoshoot. 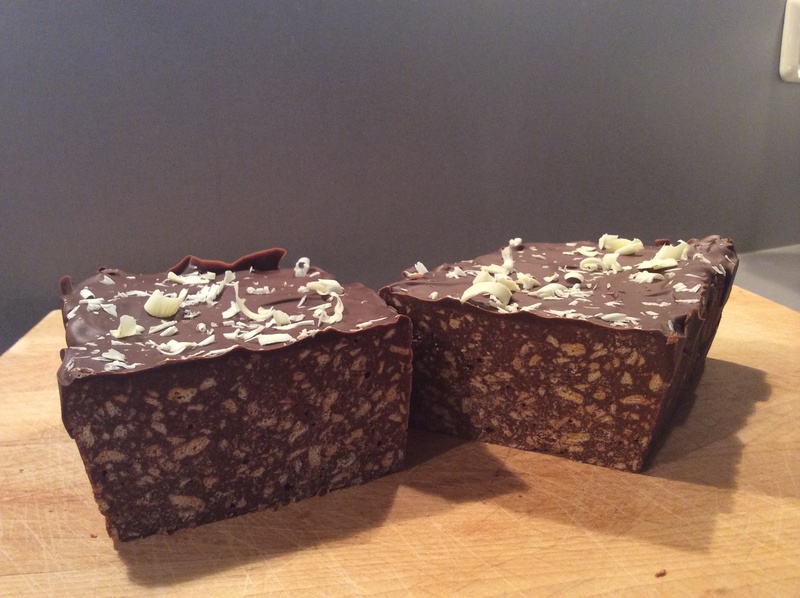 around 180 grammes of darkish 50% chocolate chopped into tiny pieces. A machete works well , but a large sharp knife is fine too. You don’t need to weigh this stuff unless you want to, just work it out roughly from the packets. Please note if you use cheap and nasty chocolate it won’t magically turn into good chocolate, so always use the best you can afford. Chuck the biscuits into a strong plastic bag or ziploc bag and smash them into crumbs in whatever way is most satisfying to you. I use a wooden rolling pin. Fine crumbs are best. 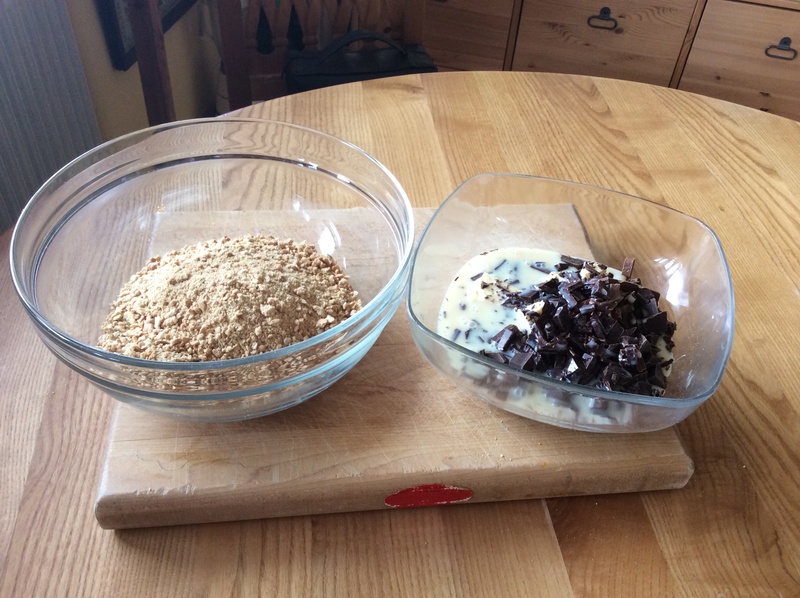 Put finished crumbs into a large mixing bowl. Throw the chopped chocolate, the butter, (I cut mine into pieces) and all of the condensed milk into a microwaveable bowl. Put it into the microwave on a medium wattage. After thirty seconds take it out. Stir it well and put it back in. Repeat until the stuff is beautifully liquid. Beat well to make sure there are no hidden bits or lumps. 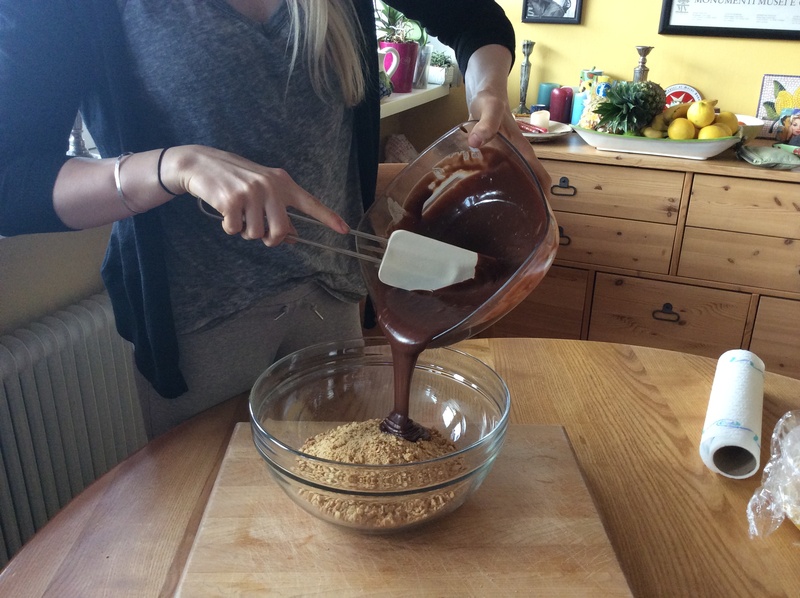 Pour the whole lot into the crumbs that you have on the side into your large mixing bowl. Stir it and stir it until everything is completely covered and you have a nice ball like mass. Put this mass into the prepared loaf pan and flatten down. Bung it in the fridge for about hmmm, four hours maybe. 100 – 120 grammes of chocolate, perhaps half milk, half dark? As you wish. Melt this SLOWLY in the microwave in a small dish until totally melted. Take the cake out of the fridge. 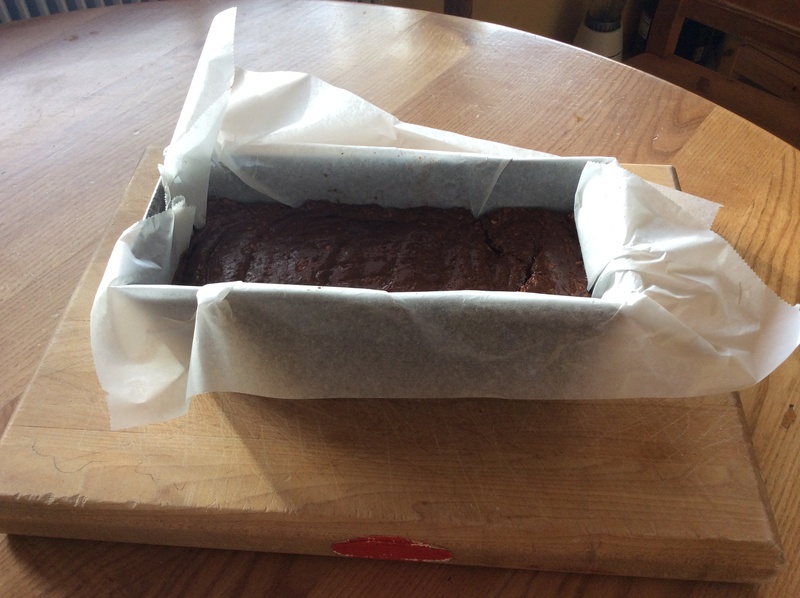 Lift it out of the pan using the excess greaseproof paper. Pour the melted chocolate onto it and spread out nice and neatly, dripping down the sides no problem. As you can see in the picture I used a potato peeler to scrape a few strips of white chocolate onto the finished cake. ‘Coz it looks cool. Put back into the fridge for a while to set the chocolate. Eat when ready. I cannot tell you how utterly delicious this is. It slices well because the condensed milk stops it from turning into a hard lump. But be careful, it is addictive. It never fails to impress, despite the über-simple ingredients. If you keep these few ingredients on hand, you can throw this together so quickly. You need never say no to making a cake again. Let me know how you get on. I just proof-read this to my husband who says he can make it blindfolded by now. See you next month, where I will feature a vitamin or two. 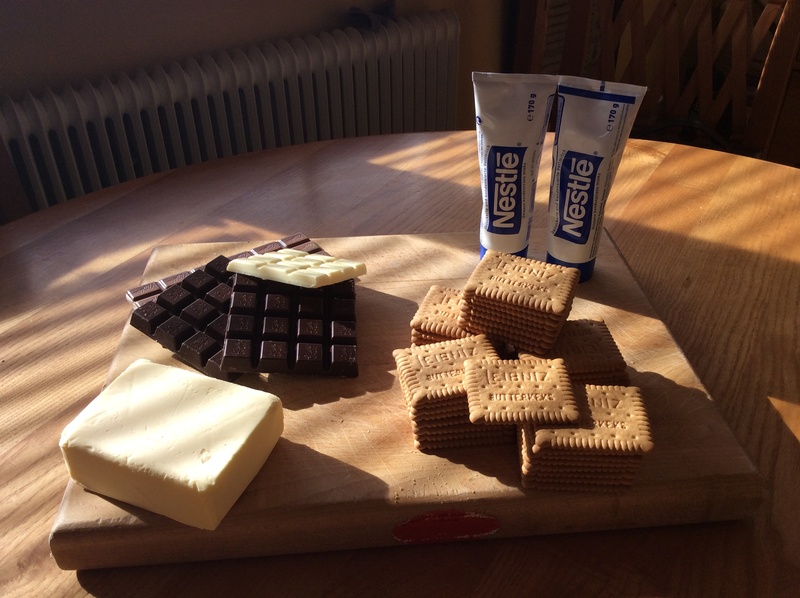 This entry was posted in Food and tagged Cake, Cookie Queen, Food, Fridge Cake, Recipe. Bookmark the permalink. Loved this! The title in particular, and the moody, sunlit photos. The QA technician in mid-lick. I wonder if this choco-fest would pass the rules of our Cake Club. Sadly not, probably, as cakes made in microwavable ovens may be seen as a bit modern. On a side note, one of the only two times I saw my mother cry was when a tin of boiling condensed milk exploded prematurely, splattering the entire kitchen like a crime scene, and burning her quite badly. It didn’t put her off making caramel tarts, mind, and as this is a no-boil recipe, I too have no fear of condensed milk behaving badly. Skip the microwave bit and use a double-boiler. My grandmother made this. It is an old recipe!!!! Well, thanks for the idea for a fun afternoon – we call this cake ‘sweet salami’ and we roll it in foil to make the shape similar to salami! I personally love to add some kind of raw or roasted nuts in – wallnuts, hazelnuts or pistachio! How does it smell? Musc Maori or something? YAY! Love your home Val, the yellow in the kitchen is so sunny, Hannah looks gorgeous as always and Mr Big Jim Turbo-Gear’s room closed. Why aren’t you in bed??? Probably not the best post to read while I’m sitting here thinking of starting to eat healthier to drop the pounds the winter seems to have deposited on my hips. Chocolate would be really nice right about now. It looks and sounds delicious! And it reminds me of a cake from my childhood. It’s called “Kalter Hund” (means cold dog) and it was only made for our birthday parties. The ingredients are similar, I guess, but the biscuits are layered with the chocolate cream. Thank you for the recipe, will try that out very soon! After a wonderful sunny week it’s all grey, rainy and windy now and looking at your beautiful pictures I realize that I am in a choclate cake mood. Thanks a lot for this fabulous recipe, I can’t bake but a “no skills necessary fridge cake” sounds managable. 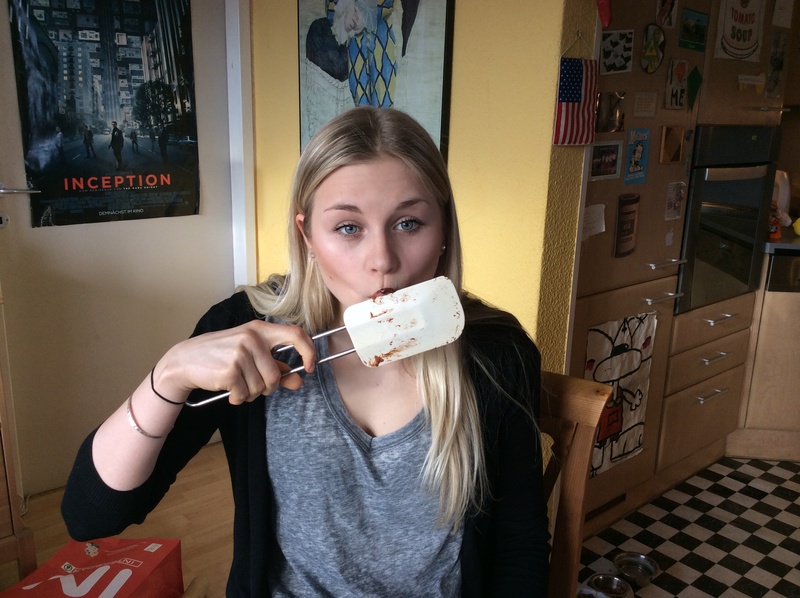 This is my kind of baking (and eating!!!) thanks for featuring this great recipe, Val! Love it Val! I am cooking a meal for mother’s day and this would be the perfect easy and yummy dessert. You’re a star. Get well soon. You know, I do. I am aware that microwave doesn’t sound as upmarket/posh/impressive as bain marie, but it works just fine. As long as the microwave is not on full power. I open and stir every 30 seconds or so. I wouldn’t use the microwave for melting milk chocolate though. Woukd probably scorch or go lumpy. But then I only use dark ……. Ohhhhhh my goodness. I am definitely trying this. I’m off to the store to get condensed milk…. That looks amazing! I totally want to make this right now. Thanks for the wonderful recipe and step-by-step instructions! If/when you make it BB, please drop us a quick note!! I promise you’ll add it to your recipe list!! xxxx. Here we don’t get those condenced milk tubes 😦 I think it’s a great idea, much more convenient than cans – especially if you’re using it in small quantities.